Mental health provision needs to be enhanced, not cut. To see the full article, including a video, go HERE. Relocating mental health services from Perth to Dundee will cost lives, campaigners have claimed. Almost 50 protesters gathered outside Murray Royal Hospital to stage a demonstration against NHS Tayside’s bid to move services from the Fair City. 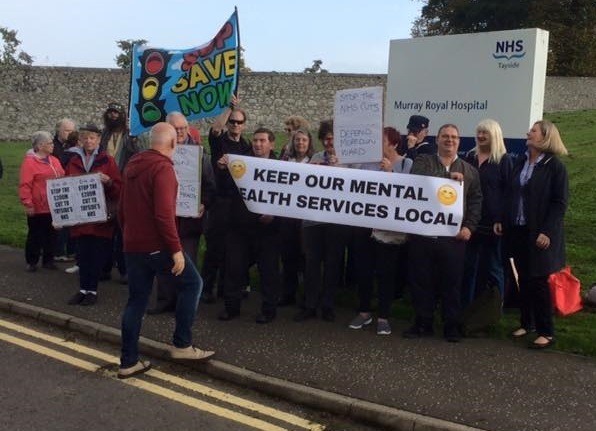 The health board is holding a consultation on a proposal to close the Moredun ward at Murray Royal Hospital, which treats acute adult psychiatric inpatients, and move operations to Carseview in Dundee. The protesters included people who use mental health services, carers, service providers and the general public, and the group was given support by passing motorists, who tooted their horns as they drove past. Susan Scott, manager of local mental health charity PLUS Perth, which organised the demonstration, said: “Scotland’s most recent Mental Health Strategy is really disappointing. It’s not innovative enough. “It is in NHS Tayside’s interest to listen. They need to let go of a bit of the power because they are not getting it right. “We see a lot of people in crisis and it’s going to get worse with people having to travel to Dundee for help. If Moredun does stay we have a better chance of having locally-based crisis response. “It’s awful to be in mental distress and to be plucked from your safe environment and taken to some place like Carseview which has struggled to keep people safe. Philip Stott, of the Socialist Party, said planned NHS Tayside budget cuts would equate to £1million a week over the next four years. He said: “NHS Tayside calls it savings but we would call it cuts. Campaigner Tracy Swan, whose daughter was treated in the Moredun unit prior to her death, welcomed the protest. She said: “It’s been a great response. We’ve also had a lot of emails from people that couldn’t be here because of work but support us. Chief Officer for Perth and Kinross Health and Social Care Partnership, Robert Packham, said: “Since the consultation started at the beginning of July, we have already attended more than 50 engagement events in locations across Tayside talking with a wide range of groups and organisations with an interest in mental health and learning disability, the public and our staff.